I am positive the terrorists are chuckling away about this. So is everyone else, even the sufferers, because of the sheer absurdity of the notion. Can you imagine a WhatsApp exchange like this occurring between two terrorists? What, you think they don’t use WhatsApp? Well, shame on you for being so unimaginative because this totally happens. You think you know better than the government? Such conversations are held every time there is a bomb blast, because let’s face it, we all love talking to our friends – yes, even terrorists. 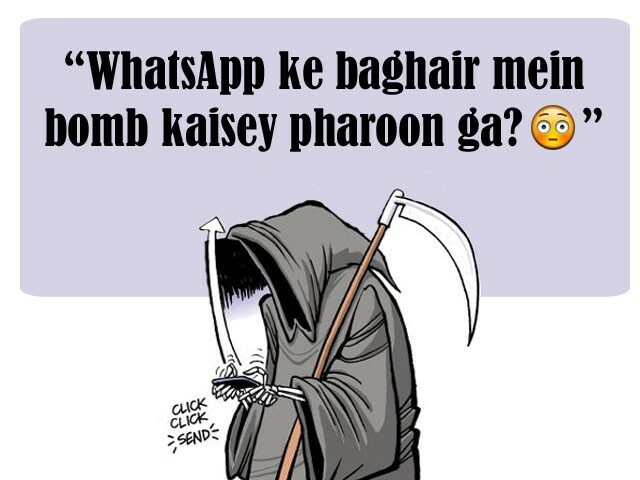 However, thanks to the foresighted Sindh government, terrorists (and also the harmless communication junkies of Sindh) might soon be on a three-month break from their Viber/Tango conversations, WhatsApp-ing and Skyping with their homies. Yesterday, Sindh Information Minister Sharjeel Memon – a man far ahead of his time – suggested the idea of blocking online communication networks because he believes that terrorists make use of them. The Sindh government appears to have welcomed this suggestion with open arms. Anyone using iOS and looking to get around the YouTube ban I suggest downloading VPN One Click. Oh, the irony. Really, Bilawal? I’m pretty sure terrorists can SMS each other about their evil plans without getting caught. Pardon me, but I can’t remember the last time we arrested someone based on suspicious text messages. I mean, it just sounds a little too ridiculous, doesn’t it? Terrorists Snapchatting, having Android battery trouble, or Skyping with their bosses about their perfect fitting bomb vest over a cup of kahwa? Speaking of Skype, here are some #TerroristSkypeIDs I found on Twitter. It seems silly to me, but for five minutes, I’ll believe the outrageous claim that terrorists use these services. In that case, we all know that terrorists are starkly oblivious to the use of mobile VPNs and internet proxies. Thank God they have never heard of Hotspot Shield or Spotflux. They haven’t, right? Because Sharjeel Memon hit the nail on the head only if we assume this. Though why three months, I wonder? Kind of an odd duration, isn’t it? Maybe the government also wants students to complete their academic year 2013 without getting distracted by WhatsApp notifications? This would have made for a better excuse to block these services, to be honest. If the kind of effort the government puts into limiting access is put into more, dare I say, ‘mature’ ways of improving security, maybe we would have a working solution like perhaps, charging for these applications so that they aren’t as easily accessible? And maybe, that way, conversations and even payment details of the users can be traced? But that would, obviously, be too complicated. I am positive the terrorists are chuckling away about this. So is everyone else, even the sufferers, because of the sheer absurdity of the notion. Terrorists can do what they do even with just text messages. Even the occasional suspension of mobile services is not a barrier if you have a nice walkie talkie set or a small clandestine communication device. Just like the YouTube ban did, this step, if taken, will help no one. The Sindh-based halves of couples in long distance relationship will be cursing Sharjeel Memon for all we know. That is the only real worry. I have no idea when this ban will be put in effect, but I have my ticket ready. When it does happen, I’ll be in Sargodha taking full advantage of my Smartphone. Will banning Skype, Viber and WhatsApp reduce terror in Sindh? A completely absurd decision from the government. So illogical. Has it occurred to you that Sargodha is in Punjab and she may have relations in Sargodha? ?